Hope you all had a wonderful Christmas!!! We sure did…now the digging through and organizing starts. I finished this a year ago (can you tell by the wrinkles?) for Martingale…and now I can finally share it!The quilt was made for this book: Modern Quilts from the Blogging Universe (Patchwork Place). It was the first time I’d contributed a quilt pattern to a book…and although it is long process, it is always fun to be in a book! 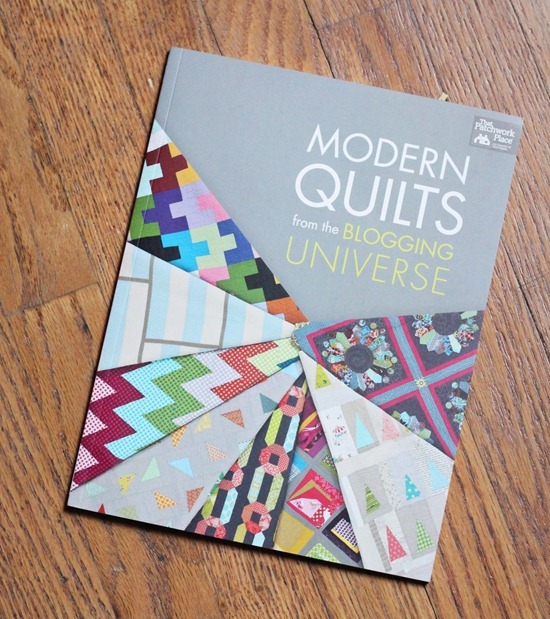 It’s a great book…all 19 of the quilt projects are beautiful and the book styling is lovely. I was asked to make this quilt last December on a tight schedule and no time…so I was thankful my friend and neighbor Amber pieced it for me within a couple of days (hi Amber!). Then I quilt and bound it and sent it off. 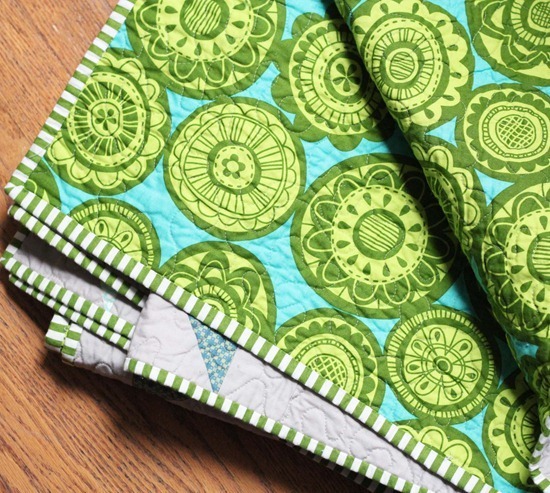 My favorite part is this green binding…I will never tire of striped bindings. You’ll see more of this book soon I’m sure! I love the binding too!! I just got the book for Christmas! Your quilt was my favorite of course! Eeeek!! I love everything about this! The colors, the binging, everything! Awesome quilt. Congratulations! I will be needing this book pronto. Oh Beautiful quilt!! I love the stiped binding too and congratulations on being published. I love your quilts! I ordered this book on Christmas Day with an Amazon gift card I received! So happy to hear your lovely quilt will be in it! 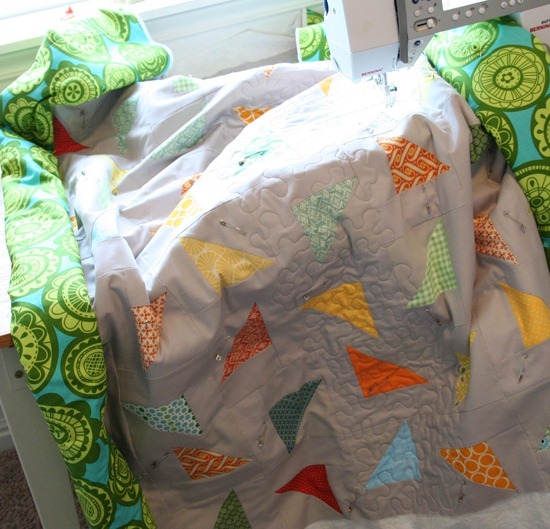 I love the colors on the quilt, and that binding… the pattern is cute too. =) Congratulations on being published in a book! I love the backing & binding too! Congrats on being in the book! Love the striped binding. You have me hooked. 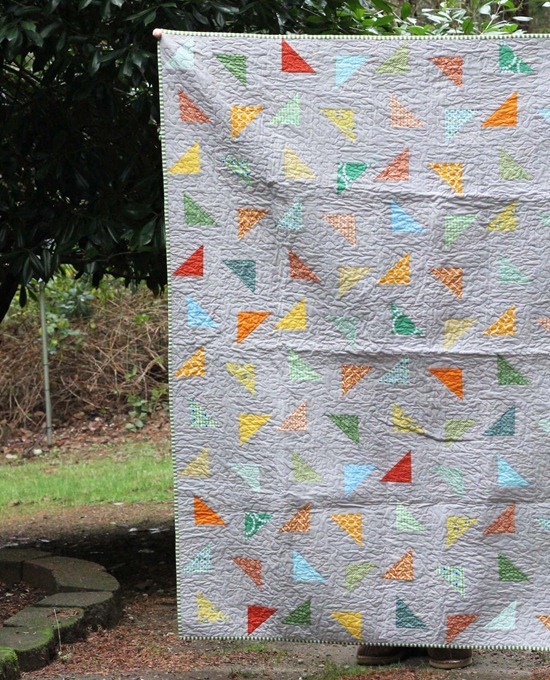 Oh I LOVE this quilt!! What a fun quilt! So much movement. I agree with you about striped binding, I have an addiction to it as well. 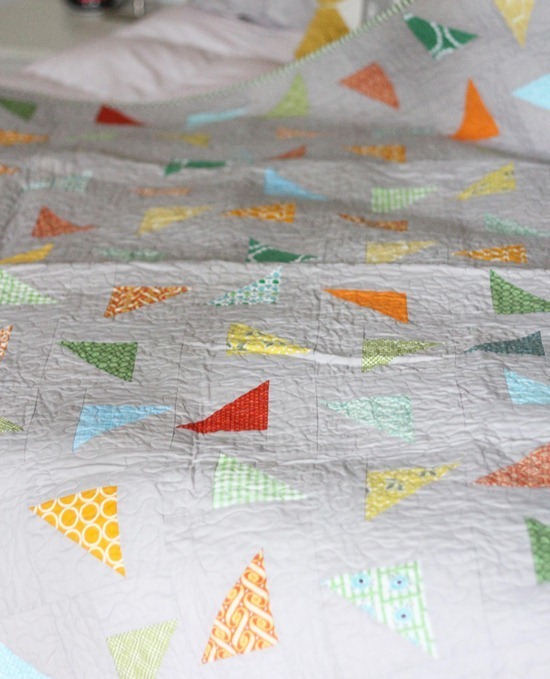 It just adds such playfulness to a quilt. Blessings! Great quilt – my book is on order! I love the simplicity of the pattern and the soft background. What a great name for the quilt too. I do love your patterns– they are well written and illustrated. Juice Boxes is my favorite (so far). Very nice. I put that book on my wish list this year. Santa didn't bring it to me so I have to get it for myself. Super fun quilt! It reminds me of confetti! I agree wholeheartedly on the striped binding! You always are a source of inspiration for me. Thank you! Oh wow that is beautiful! Going to check out that book! I got the book for Christmas and love it. You are the second contributor I have seen comment on the process of this book–not liking it. 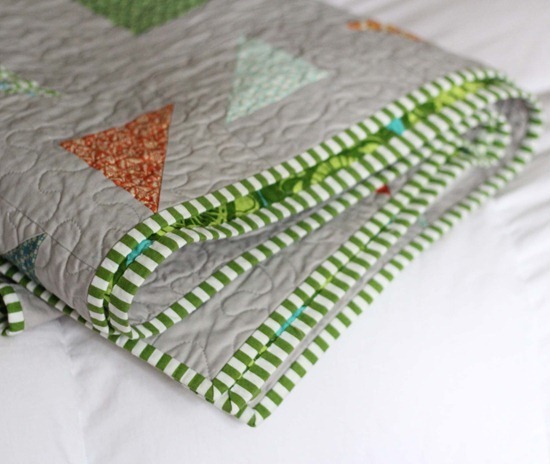 Didn't you have a quilt in a Chrissie Grace book? Was that different since it was a quilting bee thing? Just ordered the book and now glad to know this beautiful quilt will be in it. Thank you for sharing. Oh I LOVE this one!!! I will definitely have to check out the book.